There are several steps you can take to delay the onset of wrinkles, such as avoiding smoking and protecting your skin from excessive sun exposure. Unfortunately, nothing save plastic surgery can reverse the inevitable effects of gravity. A facelift is an effective way to restore your youthful contours by correcting problems such as facial sagging, displaced or absent fat, loosened and sagging skin, and deep creases. 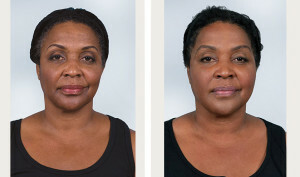 Some facelift patients choose to have a neck lift performed as well, which prevents the possibility of the sagging neck skin and jowls from betraying their age despite the facelift. A neck lift involves tightening the skin and muscles to lend greater definition to the neck contours. When you speak with a plastic surgeon, be sure to ask about the various approaches to lift surgeries. Some surgeons offer mini lifts as an alternative to conventional facelifts. Your surgeon may even offer FaceTite, which is a nonsurgical method of rejuvenating and tightening loose skin. FaceTite uses radiofrequency energy to restore a patient’s youthful appearance. Although FaceTite cannot eliminate fatty deposits of the neck or jowls, its skin tightening results are said to be as effective as those of a mini facelift. As the years pass, it becomes harder to eliminate stubborn fat deposits through diet and exercise alone. In 2017, give yourself the gift of youthful contours with procedures such as Smart Lipo – the next generation of liposuction technology. Smart Lipo uses a special laser to break down fat deposits. Its gentle approach minimizes side effects and it can even stimulate collagen formation. Consider having a BodyTite treatment in addition to Smart Lipo to maximize the skin tightening effects. For women who have had one or more pregnancies and for those who have lost a great deal of weight, a more comprehensive approach may be required. Consider asking your plastic surgeon if you’re a good candidate for a tummy tuck. A tummy tuck involves tightening the underlying abdominal muscles and removing excess skin. It may also include liposuction to address the fat deposits around the abdomen and hips. Dr. Thomas Loeb is a world-renowned, board-certified plastic surgeon who is privileged to serve patients in New York City and beyond. He performs a full menu of surgical and nonsurgical rejuvenation treatments. Dr. Loeb invites you to schedule a confidential consult in his office to discuss your aesthetic goals and age-related concerns.